Touch enlightened official and get your wish come true before Christmas! 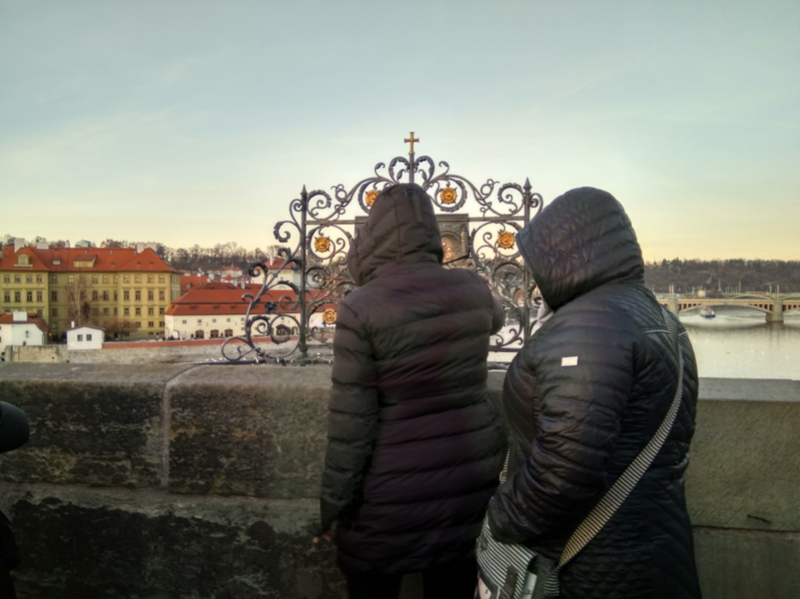 There are countless mysterious, romantic and culturally enlightening places in Prague an adventurous tourist would probably be eager to know about. 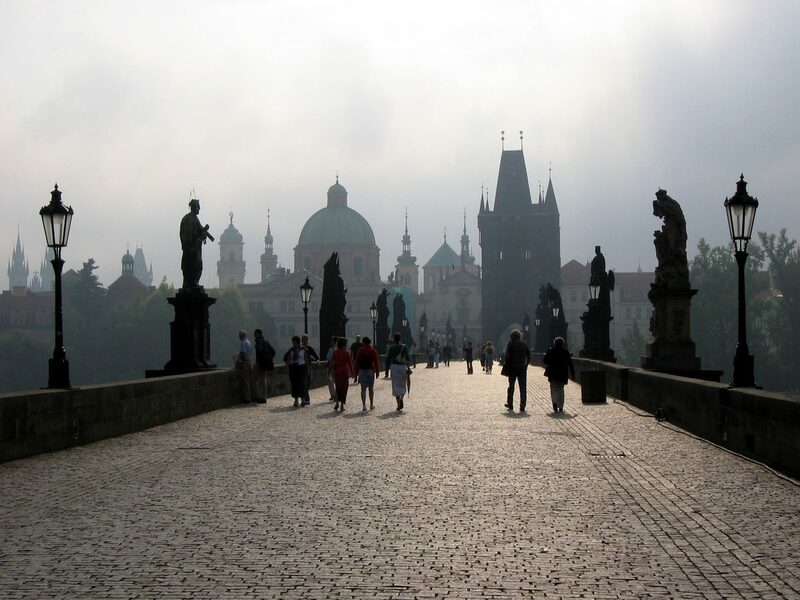 Yet as we all know the darkest place is under the candle, and inspired by this knowledge I will lead your steps along hundreds of other visitors to the good old Charles Bridge. 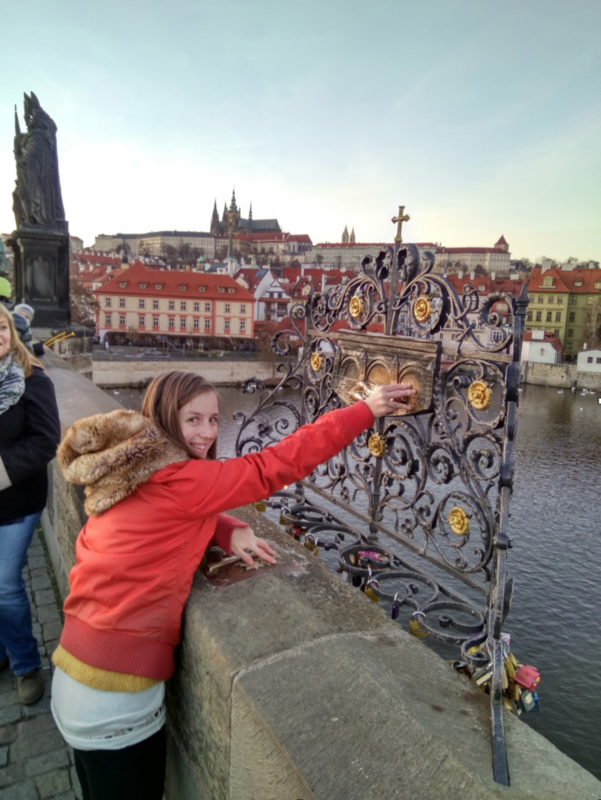 The Charles Bridge is the oldest bridge in town (the foundation stone being laid in 1357) and another proof that Czech people just can´t stop thinking about carnal pleasures even during bridge building. As a result of this it is said that the bridge contains also eggs and milk. 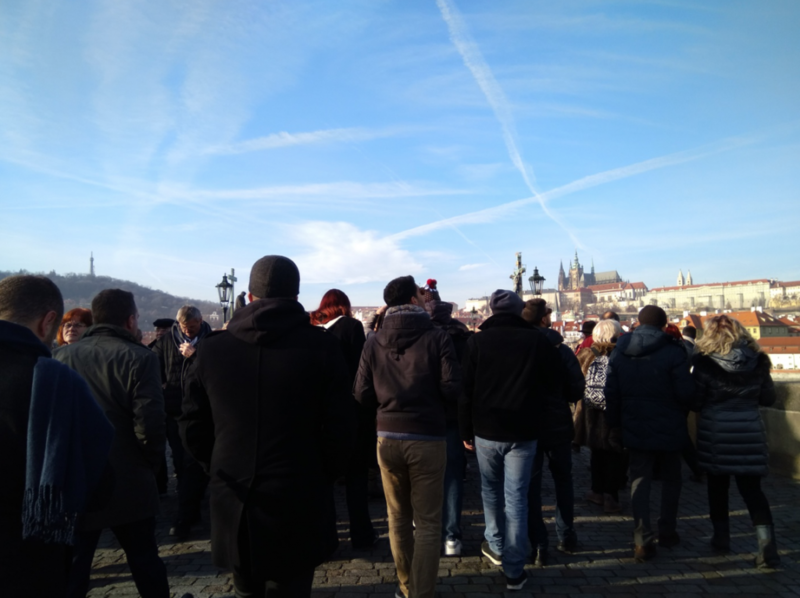 The naive expectation of having a peaceful walk on the Charles Bridge, enjoying fully the historical atmosphere of a small Eastern European town someone might perhaps hold, will be probably not fulfilled only unless ceaseless crowds are on your ideal romantic experience list. However for those introverted you, who got cold feet just now, please don´t get too dispirited by my heartless remarks. The magical atmosphere of this place, which feels new and different even during 500th visit, totally overshadows the fear that the almost 700 years old bridge might collapse every second under the attack of eager tourists. 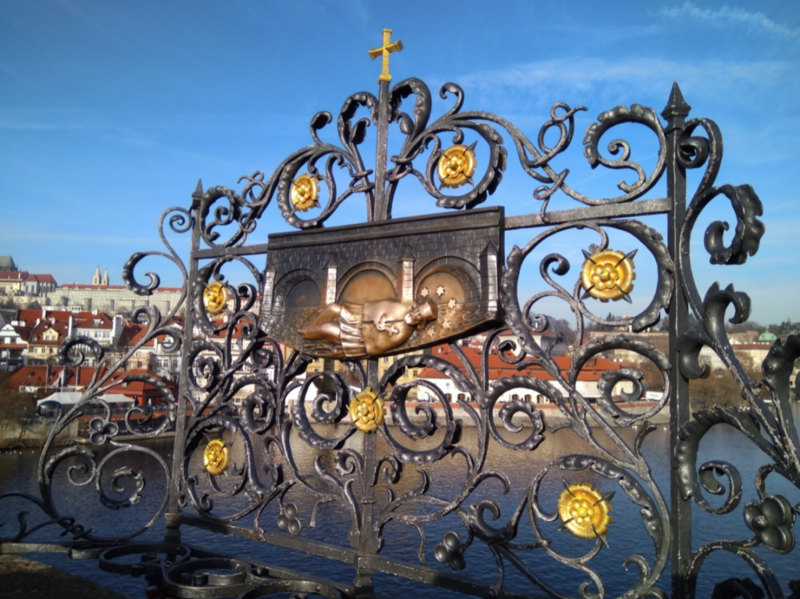 But it is exactly the beauty of the place which makes most of the tourists indulge in mindless awe, leaving them often unaware of the most interesting spot of the whole bridge – the tiny statue of John of Nepomuk hiding between a golden grid in the middle of the bridge wall. This is the time when I get superstitious and having thousands of wishes in my head in the time of Christmas, when we should think of our neighbours, I pick up the most useless and selfish one, approach the statue and try to suppress the knowledge of the true identity of the depicted saint into my deepest levels of subconsciousness. Yet I am prepared to make a journey into my subconscious again in order to shed light on this little tragic comedy story. 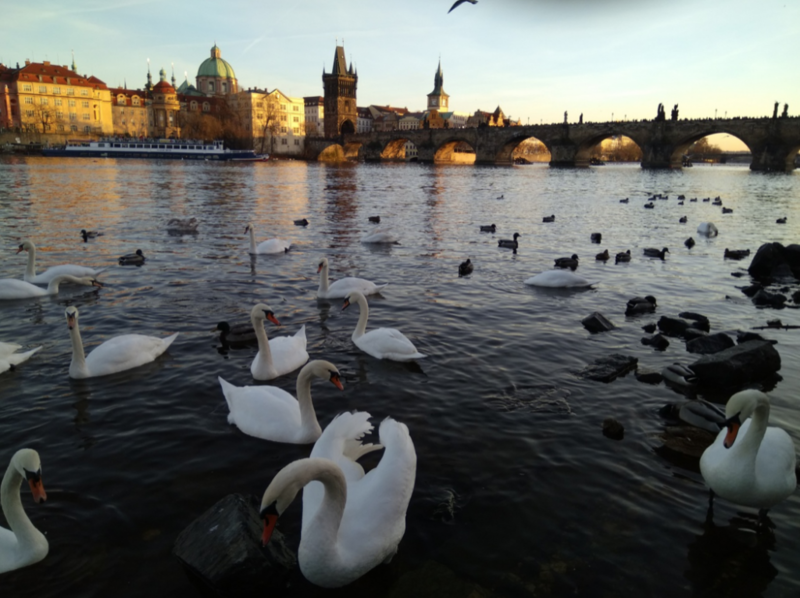 According to the legend, five stars emerged on the surface of Vltava River (the one flowing under your feet while standing on the bridge) in the 17th century. (Hint: it was right after the end of 30 years war, when 85% of people in Czech lands were Protestants and all of them had to either emigrate or convert to Catholicism… what an interesting coincidence!). People saw the emergence as a sign from heaven and dived into the water. To their astonishment, they found the skull and bones of the 14th century priest John of Nepomuk right there! And what more, his tongue was still preserved! (Well it is actually quite difficult for modern capitalist creatures to imagine such an excitement over few bones with no apparent business utility, but just you wait!). John Nepomuk was said to have served as the personal priest of the kings Wenceslaus IV wife Žofie. He enjoyed her full trust and thus she told him all her personal secrets. Unfortunately the king became afraid, that he might have “parohy” (horns, in Czech language having horns means to be cheated on by wife, I am sure she wasn´t the only one for him either though). 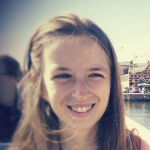 He wanted John to reveal everything she entrusted to him during confessions. John however being a decent priest refused to break the seal of confession even during torture and was eventually executed by throwing into the Vltava River. And because this miracle he was canonized and proclaimed a saint. According to the legend when you touch the five stars around his head with your right hand and five stars of the cross below with your left hand, John of Nepomuk being able to return to Prague again after his death (even if in the form of bones) can help you to return to Prague again also. Or just fulfill some of your wishes. While being a bit reluctant of destroying the mystical curtain of John of Nepomuk’s holiness and revealing his true identity, I realized that in today’s world we don´t fall victim to the presumption, that a hero or icon must necessary be moral, or even can be moral, since we are all just human beings, having our cute little flaws. John of Nepomuk while indeed having lived in the 14th century and served the king Wenceslaus IV, he wasn´t a mere priest but the vicar general of the Prague archbishop. It was because of the fact, that John threatened the power of the king with his intrigues and rising power that the king decided to get rid of him and his bones ended in the depths of Vltava River. After the end of the 30 years war however, there was an urgent need for some catholic saints in Czech lands (how sad) and his newly by chance discovered bones were a great opportunity to trick the people. 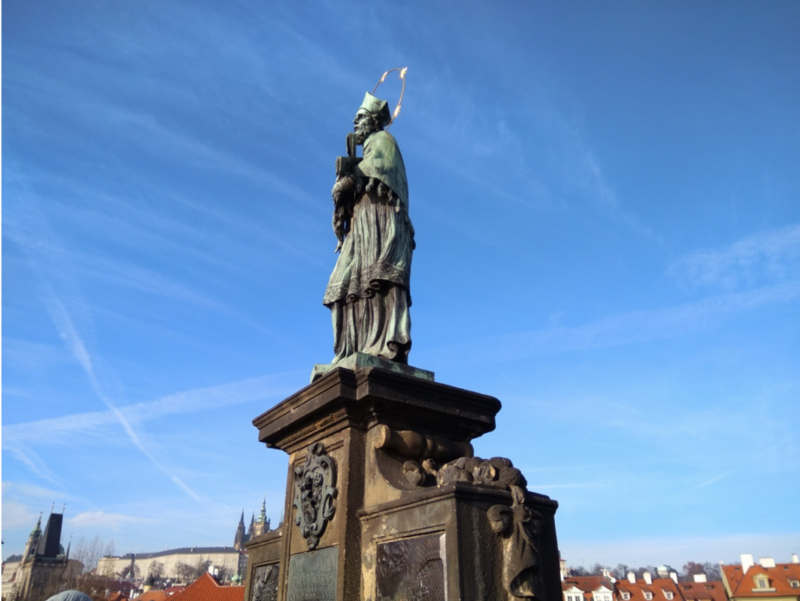 So please, when you make your trip to Prague and see the beautiful scenery of this city from the Charles Bridge for the first time in your life (envy you), spend a thought about Czech history and appreciate the creativity and narrative genius of our ancestors. Touch the statue of John of Nepomuk and make a wish (and at the same time please avoid the unpleasant feeling that the society actually didn’t change that much over the centuries). I am sure that a vicar general who has made it to a saint is surely powerful enough to make it come true! Previous Previous post: Hello Steak, Nice to MEAT You!